We are an umbrella group for local campaign groups and communities opposing new risky methods of oil and gas exploration across the South East. Judgement was handed down today at 11am. We are Ann, Sue, Natasha, Constance, Vicki and Jacqui. We are lawful, respectful citizens who simply want to raise awareness of the potential risks of oil and gas activities to our land, water and air across Surrey and Sussex. We have put our names forward because we could not stand by and watch this attack on citizens' rights without challenging it. This oil and gas company do not want us, local people to have a say. The sweeping injunction sought by them is against ‘persons unknown’ – that’s all of us. They want to prohibit a wide range of actions including ‘combining together’ to interfere with the company's ‘economic interests’. We fear that this could prevent us from speaking out in the press and on social media and organising local campaigns against these environmental dangers to the countryside and the communities in which we live. They seek to build and expand on an injunction granted against local communities and campaigners opposing fracking in Yorkshire and the East Midlands brought by the giant multinational INEOS last year. The defendants say: “We welcome the partial support the judge gave to our case but we’re going to fight on. Oil companies cannot be allowed to set the legal framework for protest in this way. Dissent is not a crime and the penalties for breaching an injunction are severe”. But they welcomed the Judge rejecting a number of the oil companies’ restrictions. The Judge ejected UKOG’s inclusion of their offices in Guildford as part of the injunction. He accepted Friends of the Earth case and disallowed a blanket ban on publicizing and promoting protest activities. The Judge also removed some of the most restrictive clauses – like the attempt to stop monitoring what goes on at the sites. The Judgement does however ban some protest activities which affect UKOG’s commercial interests at Horse Hill in Surrey and Broadford Bridge in West Sussex which have been prioritized over the community’s legitimate opposition and concerns about the adverse environmental impact of UKOG’s activities. The Judge said that Human Rights were engaged in the case. But that the rights to freedom of expression and freedom of assembly and association were limited by the commercial interests of the oil company. A statement on behalf of the defendants from the Weald Action Group, said: “It was worth fighting this draconian injunction. 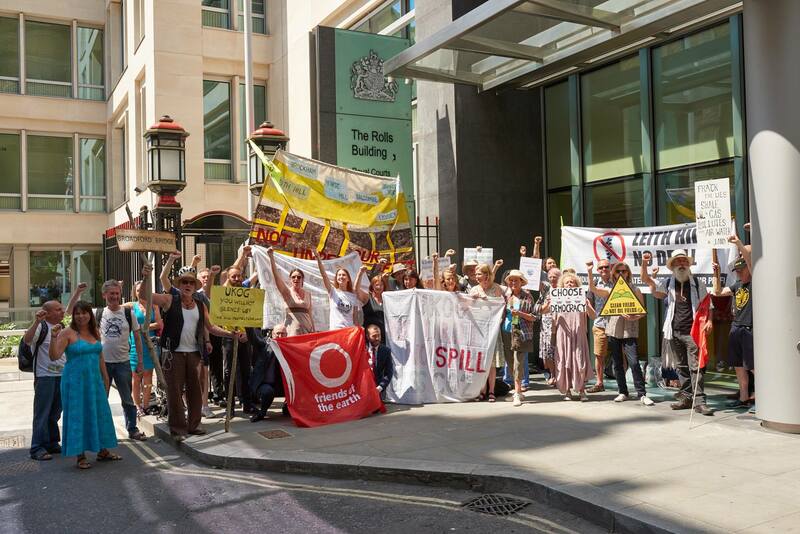 If we hadn’t done so when it first appeared in March UK Oil and Gas might have succeeded in its attempt to ban lawful protest in an injunction which then covered four sites at its Headquarters and over Markwells Wood. The Judge has drawn an important line in the sand on some issues like the right to publicise and support protests and the right to monitor what goes on at the sites. He also limited UKOG’s attempt to curtail free speech by rejecting UKOG’s claim to restrict communications with the company and its supply chain. UKOG also abandoned their attempt to ban direct action as unlawful. “UKOG have ended up with an injunction at two sites and which restricts significantly less than they sought. This is a partial success. But the injunction is still against persons unknown – which means everyone potentially. The injunction as it stands leaves considerable uncertainty as to what is and isn’t allowed and that is one of the things that are seriously wrong with it. It is unclear and complex and will continue to deter participation in entirely lawful and peaceful campaigning. “Communities across the South East are rightly fearful of the threat posed by these companies to their environment and people will find it very confusing to work out what they can and can’t do under the terms of this injunction. “We’re going to fight on. Oil companies cannot be allowed to set the legal framework for protest in this way. Dissent is not a crime and the penalties for breaching an injunction are severe. We do not believe that powerful private companies should be able to use the law to silence and intimidate campaigners concerned about the dangers and damage to the environment and our communities”. The defendants are considering applying to appeal against the ruling which is part of a trend of court decisions targeted at silencing the growing dissent against fracking and other forms of onshore oil and gas exploration. Sites across the South East are being developed by UKOG as part of their aim to get “back to back wells in an industrial production”. This has prompted concerns about the contribution of onshore oil to catastrophic climate change, impacts on drinking water and air pollution; HGV and other heavy traffic movements on narrow country lanes. The Weald Action Group supports local communities facing threats from this expansion. Our court hearing started at 10.30am Monday 2nd July, with the court listing only going up online very late in the afternoon Friday 30th June! UKOG's solicitors served another two witness statements and another additional skeleton argument around the same time which is simply not protocol. Despite Master Marsh agreeing at the 19th March hearing that a High Court judge would be more appropriate we were assigned Deputy Judge John Male QC who went ahead with accepting the case despite specialising in property law and little experience with human rights. John Male QC appeared fair and asked all the right questions to both sides but being such a complex case, he has reserved his judgement until August. We are asking you to send a few positive thoughts to us for a very positive outcome! We will keep you updated. We can't thank you enough for your donations. Without you, this wouldn't have been possible. Please keep sharing this crowdfunder and please keep the donations coming. Thank you again from the bottom of our hearts for supporting our legal challenge against UK & Oil & Gas. We really value your support and donations. Please keep sharing! The time has arrived for our six brave defendants and our amazing legal team to step into the High Court and challenge UK Oil & Gas on their oppressive injunction. There has been an incredible amount of work to get to this point so we hope you can join us outside the High Court, The Rolls Building. Fetter Lane, London EC4A 1NL on Tuesday 3rd July at 1.00pm to support the defendants. We are extending our crowdfunder until we reach our full target of £25,000. Many thanks to all of you that have donated so far. Our solicitors have informed us the court hearing will be w/c 2 July, for 3 days in The Rolls Building. Would be great if you can come and support us so we will keep you informed. Can you please keep sharing this on your social media and through your networks. Search Twitter and Facebook for #injunctioninjustice to share on your social media.